According to the World Prison Brief, Uganda’s prisons are currently operating at over 200% of their official capacity. Overcrowding in prisons is one of the most serious challenges facing prison systems across Africa and in many other countries. Its effects can be life-threatening – contributing to the spread of infectious disease, increasing violence and levels of self-harm and suicide. Here Omar Phoenix Khan of the African Prisons Project highlights the reality of living in an overcrowded cells for Uganda’s 38,477 prisoners and reports on their work to improve health and sanitation. “You have to sleep so close that the next man sweats on top of you”. That was the answer that I received when I asked a prisoner about the sleeping conditions inside a ward of a Ugandan prison. The entire prison service in Uganda has the capacity for 14,908 prisoners, however, a recent count numbered more than 38,477. You can sit and have an academic understanding of what that means; but nothing can really prepare your senses for the beating they receive when you enter a prison ward of more than 200 hundred prisoners, meant for only 50. A difference in the quality of air is palpable; it feels heavier and thicker and your lungs and guts notice it instantly. Of course, part of it is that there is much more carbon dioxide and not nearly enough oxygen in the concrete box with naught but a few slit windows high above, but the heat and smell vie for primacy over your sensory system too. After being inside such a ward for just a couple of minutes, my body told me to run for the door. Even in that moment, I couldn’t really comprehend what it must be like to be locked in, in some cases, for more than 23 hours per day. Overcrowding in prisons is clearly detrimental to people’s health, but it should be examined with the further contextualisation of the hygiene and sanitation situation within the wards. As ever, water is key. In many Ugandan prisons, clean water is not available; not for drinking, not for cooking and not for washing. Skin conditions such as scabies are rife within the prisons and being forced into such close proximity without adequate washing facilities, you can see why. Of the 233 prisons, 55% still use the ‘night soil’ bucket system in place of a toilet. This is the degrading practice of having to squat over a bucket placed in the corner of a ward overnight – no hand washing, no privacy, no dignity. Diarrhoea is one of greatest causes of morbidity within Uganda’s prisons. These dark, dank, crowded conditions, combined with the heat, poor diet and a lack of access to clean water create the perfect storm for communicable diseases such as TB, the leading cause of death among prisoners, alongside Malaria. A holistic approach is therefore required in order to effectively address this inhumane situation. More than 56% of the prison population are actually on remand, so there is a genuine opportunity to significantly reduce the number of people within prisons by improving access to bail. The African Prisons Project (APP) is taking such an approach by addressing the whole system; high level workshops are held with member of the judiciary, the police and prison sectors to identify blockages to bail and ways to move forward, while further sessions are conducted inside the prisons, with the prisoners to ensure that people are aware of their rights to bail. This is soon to be further expanded through bespoke local radio programmes to pass the message to the community at large. APP also works to develop healthcare infrastructure. 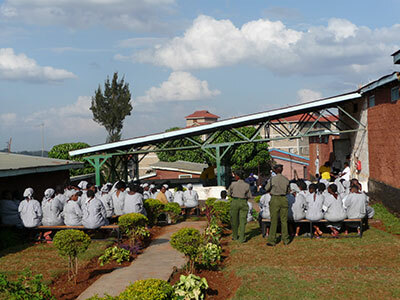 Improvements and refurbishments have been made to several prison healthcare units and development is currently on-going into compact clinics, recycled from shipping containers, to ensure that basic levels of medical treatment (both preventative and responsive) are accessible to all staff and prisoners. The eradication of the ‘night soil’ bucket system is a key aim of APP’s health department, which adopts innovative methods such as the installation of biogas toilet systems, which provide both safe, sanitary facilities and sustainable positive outputs in the form of gas for cooking and manure for agriculture. I believe that the only loss of human rights when a person is sentenced to prison should be that of their liberty – not their access to water, health or dignity. The sad fact is that when being sentenced to prison, Ugandans are also sentenced to a greater chance of sickness and death. Yet, with the investment of time, energy and resources, small steps are being made to temper this unsanitary storm. Penal Reform International has been working in partnership with criminal justice agencies and civil society in Central, Eastern and Southern Africa since the late 1990s, primarily to address the overuse of imprisonment, including pre-trial detention, one of the main causes of overcrowding, and to promote non-custodial alternatives such as community service. Find out more. The African Prisons Project’s (APP) mission is to bring dignity and hope to men, women and children in prison through healthcare, education and access to justice. APP has worked in Uganda since 2007 and currently works across 20 prisons. The main beneficiaries are prisoners, prison staff, their families and the local communities around the prisons. Omar Phoenix Khan is the Health Programme Manager at APP in Uganda, leading on sustainable sanitation, health infrastructure and improved nutrition. He previously worked as the Head of Equality and Diversity at HMP Wormwood Scrubs and HMP Latchmere House, London. Omar moved to the international prison sphere after an MSc in Violence, Conflict and Development and is looking to continue this in Brazil. Omar.Phoenix.Khan@gmail.com.